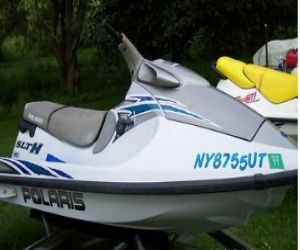 This is a 1999 Polaris Slth and it is a used vehicle. This jet ski can hold up to 3 passengers. The engine is a 700cc. You can go in reverse. The seating for this vehicle does have a bit of wear and tear to it, but nothing that is major. You can still sit down comfortably and go for a nice ride on the fresh water. Some of the rubber padding for the floor is missing, so be very careful upon entering or exiting. To the front of the PWC you can see that the handle bars are in good shape and do appear to have the safety grips. Even the side mirrors are kept in good shape and show no signs of broken or cracked glass. The body is white, blue and gray in color. You can see that there is a rubber bumper, that goes all the way around the body and it is in good shape as well. The body of this wave runner is made out of fiberglass, which can be a horrible material because it does not take much for it to get cracked. If you look to the very back, there is a hook that you can attach a water skier or even a tuber.